Have you been enjoying the Thankful at Home Tour so far? I sure have. We still have a few more days this week with several more bloggers and I can't wait to see what they share. All this is really putting me in the mood for Thanksgiving. Well, for now, it is time to get on with this party. 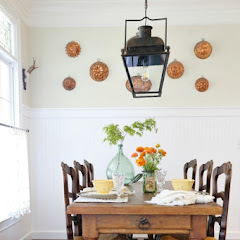 There were so many fabulous links last week and I have picked out a few to highlight. 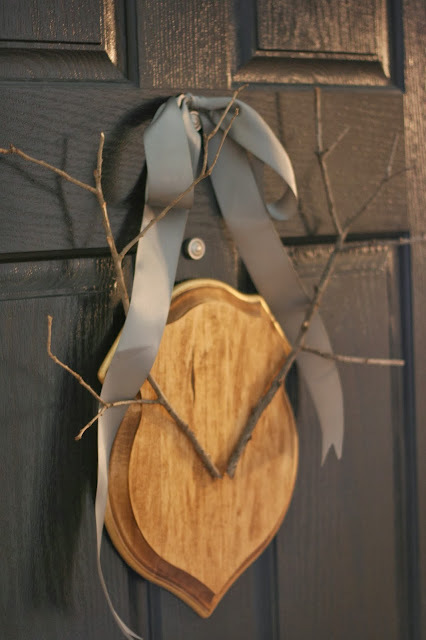 Y'all know I love me some antlers and this is such a cute idea shared by Windgate Lane. I am always amazed at the talent and creativity out there. This is a beautiful DIY dining table by Life in the Barbie Dream House. Don't go and pay hundreds for a wood headboard. Just build your own for $40 like Echoes of Laughter did. You should see what this trash turned to treasure looked like before Kammy's Korner transformed it. 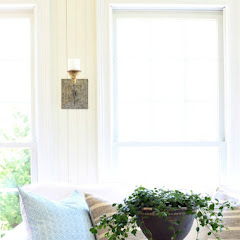 Every time The Lilypad Cottage does a home project they knock it out of the ball park. 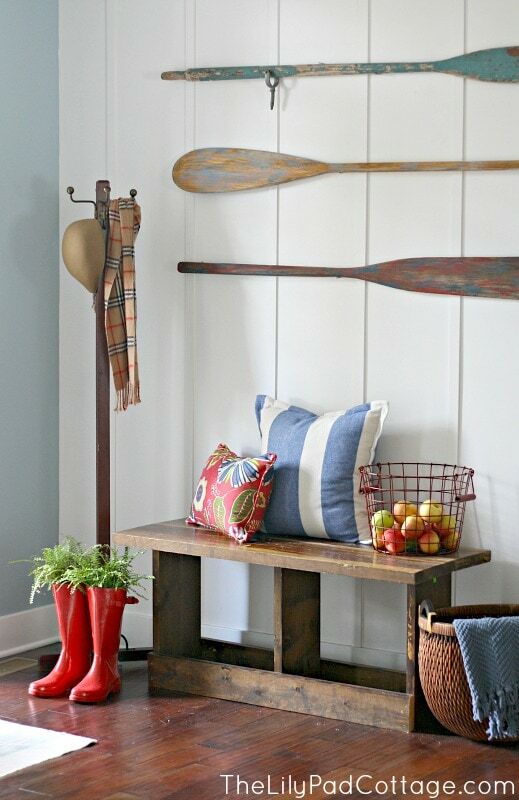 Love this planked wall added to her entry. 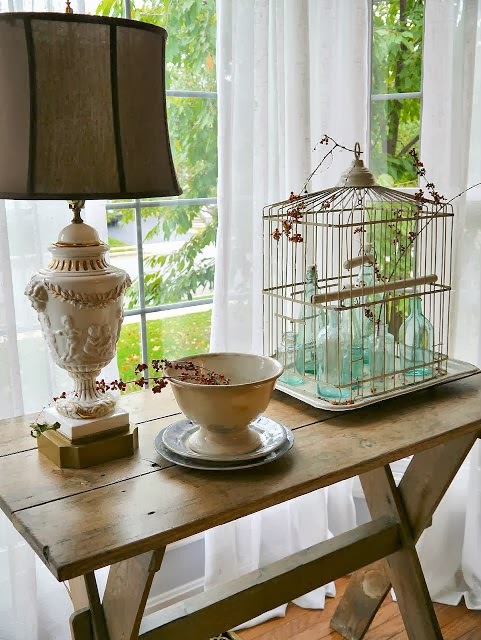 I just love this vignette full of pretty vintage collectibles put together by Chateau Chic. Decorating a rental can sometimes be daunting due to restrictions, but Sophia's Decor created a beautiful bedroom for her daughter. I love this fun mason jar chandy with the added jewels by Upcycled Treasures. 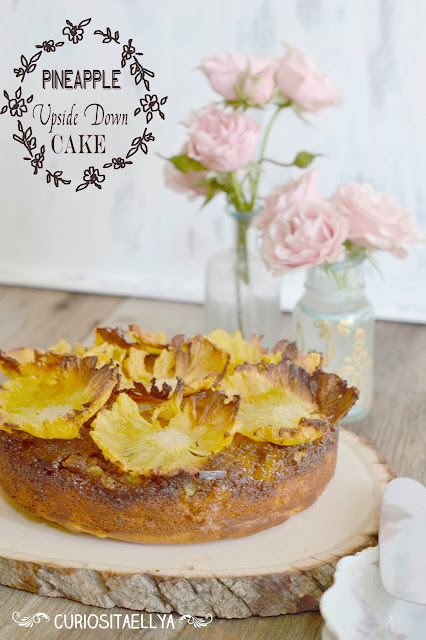 I love pineapple upside down cake and this one is so pretty with the added pineapple flowers by Curiosita Ellya. Thanks so much everyone for joining the party and if you were featured I hope you will grab a new featured button from my sidebar. 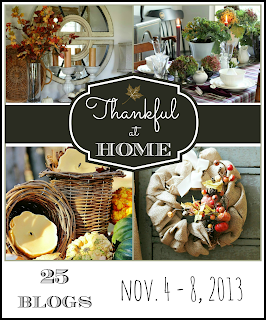 Today the Thankful at Home Tour continues and if you have missed the last two days just click on the blog names to catch up and to be inspired. Great features Kim...thanks so much for hosting! Thanx for hosting Kim! Love the features. Thanks for hosting the party, Kim. Love the features, especially the pineapple flowers. I have never seen anything like them! We love Pineapple Upside Down cake over here... we'll have to try that! 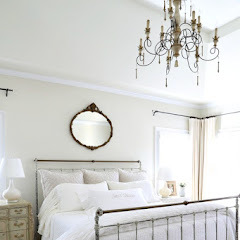 Great features Kim, love the chandy! Thanks for hosting! Thanks for hosting, Kim! I'm off to check out some of those features now. Hope you have a marvelous evening! Try it again and see if it works. Thirlled to be featured by you, Kim!!! That coffee console was pretty scary looking in it's before state, eh? :) SO LOVE linking up here each week. Having a hard time this week however, I put your button/link on the bottom of each post and it still says I don't have a link back and won't allow me to join in the party! Hmph. I'll try again next week. :) Thanks so much!!!!! Kammy, try it again. I worked on something. Beautiful features, Kim. Thanks so much for hosting each week. Love your party Kim and thank you for hosting each week. Thanks for the fun party! Have a wonderful week! Thank you so much for the feature, Kim. It made my day!! I needed a little lift today. I appreciate you hosting the party each week because I know you put a lot of time and effort into it! Kim, Thanks tons for hosting! Many thanks for hosting, Kim! Thanks for hosting, Kim. 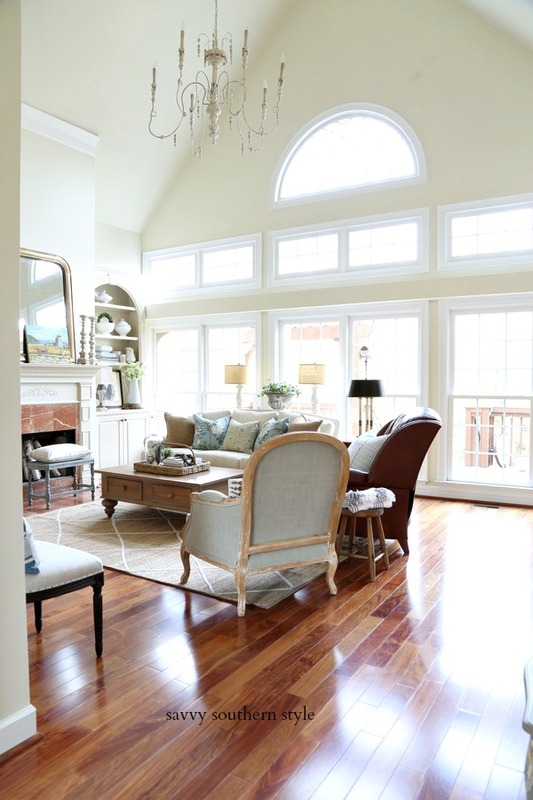 Great features, love that chandy. 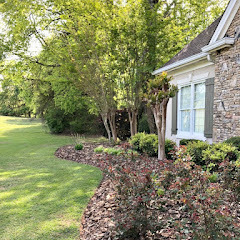 Loved what you featured…Thanks for hosting another great party Kim! Love your features! Thanks so much for hosting. I loved all this weeks features, Kim! Thanks for hosting! Loved all the features this week and thank you so much for hosting this terrific party. New follower and participant here! Love your blog! Kim, I love the antlers! Cute! Thanks for hosting! So many lovely features-I must say that those little faux antlers are just too adorable!! Thank you for hosting such a fun gathering! Thanks for hosting, Kim! Have a brilliant week! Great features as always Kim! Thanks so much for hosting. Thank you so much for hosting, Kim. It looks like it's going to be a great party. Anne's chaise looks so gorgeous. I am going to go check it out. Thanks so much for featuring me Kim! You're so sweet! Happy November!!! Thank you for hosting this great party. Thank you so much for the party, and the features are awesome! Really fun features, Kim...I am always inspired! Thanks for hosting! 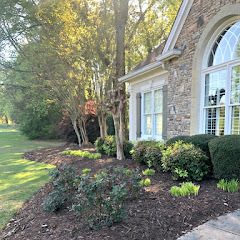 Wow Kim, great features and I'm stunned by the projects posted this week too. Thanks for hosting this amazing party! Thanks for hosting Kim. Have a great week.